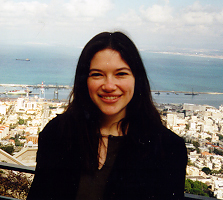 Maria Chudnovsky received her PhD from Princeton University in 2003 under the supervision of Paul Seymour. Maria made significant contributions to the field of combinatorics and graph theory. While at Princeton, she solved — in collaboration with P. Seymour, N. Robertson, and R. Thomas — the Strong Perfect Graph Conjecture, one of the best known open problems in combinatorics. Maria was appointed as a Clay Research Fellow for a term of five years beginning April 2003.